Whether you are starting your Asian tableware set or adding to an existing collection, this Cherry Blossom Bowl is a beautiful piece to purchase. It is sophisticated in shape and finish, but retains a simple, traditional look that works for a number of occasions. This is a Japanese bowl that can be saved for special events or used daily in an upscale restaurant. 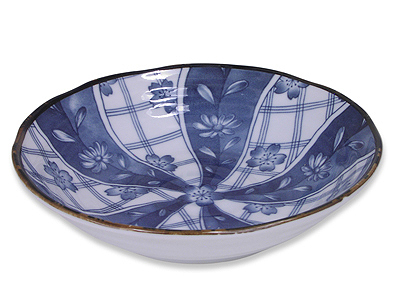 As part of the Blooming Blue and White Cherry Blossom Dinnerware Set, this mid-sized Cherry Blossom Bowl has a distinct blue and white design. The entire inside of the bowl is a alternating background of plaid pattern and solid blue. Overlaid on this background are blooming cherry blossoms that represent the great joy and uncertain timing of our lives. These blue blossoms are carefully arranged for a pleasing pattern. Other creative craftsmanship is exemplified by the definite brown rim of this Cherry Blossom Bowl, as exemplified by the larger Cherry Blossom Noodle Bowl, and soft cherry blossom on branches design found along the exterior of the bowl. As versatile in use as this bowl as beautiful, you are sure to choose it for serving small appetizers, soups, salads, and side dishes during any meal.